GATRAD Cal-Test Laboratories and Research Pvt. Ltd., is offering an accredited Calibration services and facilities by meeting the requirement of Industries, commerce and institutes in India and abroad, since last 15 years. All the calibration and measurement performed establishes the traceability to national standards and adhering SI units of measurement. 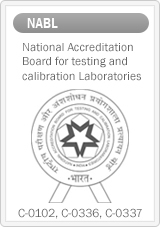 Majority Calibration facilities are covered under scope of ACCREDITATION vide Certificate No. Mechanical C-102, Electrical C-0336, Thermal C-0337. You may visit NABL website via following link to for further information.